Specialist journalist on defence industry, military issues and technology. He graduated from the Faculty of History (MA) and the Faculty of Journalism and Political Science (post-graduate studies) of the University of Warsaw. Maciej Szopa is a graduate of history and journalism studies at the University of Warsaw. As an author of articles he started his career in popular-science magazine ‘Historia Polski’. After that he was a journalist in ‘Wprost’ weekly (business and on-line divisions) and in ‘Polska Zbrojna’ magazine. He was an editor and journalist of ‘Nowa Technika Wojskowa’ monthly and author of specialist and popular-science articles of ‘Poligon’, ‘Lotnictwo’ and ‘Technika Wojskowa Historia’ magazines. Editor-in-chief of the ‘Polish Defence Yearbook’ that is data compendium for foreign customers about Polish defence market. Leading editor of annual, bilingual special issue of ‘Nowa Technika Wojskowa’ – ‘Nowa Technika Wojskowa MSPO Special’. 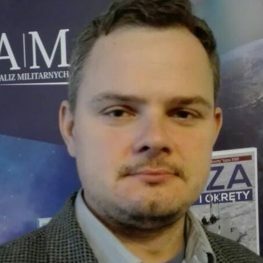 Currently employed in Military Research and Analysis Group (ZBiAM) as an editor and journalist of ‘Wojsko i Technika’, journalist of ‘Lotnictwo Aviation International’ and an author of popular-science articles in ‘Wojsko i Technika Historia’ magazines. Leading editor of special issue of ‘Wojsko i Technika MSPO Special’. Author of analyses and specialist articles dealing mainly with aviation, unmanned systems and future technologies. Author and publisher of war-game about modern military conflict in Central and Eastern Europe (‘Orły i Rakiety’/‘Eagles and Missiles’) and historical monograph ‘Grunwald 1410’.